My sister invited me to go with her to an event known as “Merlefest” in North Carolina last weekend. We went, along with about 75K other folks, and it was a really amazing festival. She had told me quite a bit about it, and her pitch to get me to go (apart from a four day visit with her) was that I would learn a lot to help my son, the luthier. I did learn, although not so much about luthiery. First, I learned that God is not out of fashion in the hills of North Carolina. One forgets how “politically correct” our world has become. At Merlefest, I heard all about God, via old-time gospel music (which I love) and many casual references. Here’s an example: In introducing a love song to “Mary” country super-star Alan Jackson said that his wife’s name is Denise, but that didn’t work in the song, so he figured that maybe she wouldn’t be mad if he used the name of Jesus’ mother. It was off-hand and natural. I liked his explanation as well as the song. Second, I learned that it is possible to feed thousands efficiently with food that was both economical and reasonably healthy. There are several places for food at the festival, but the main one is the “food tent” across from the main stage. 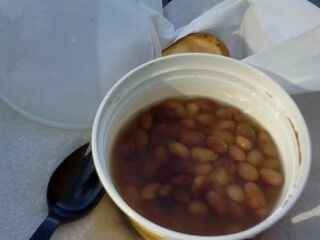 There was a booth that sold pinto beans and cornbread for $4. This meal was delicious and filling, and far better than the funnel cakes that I expected. Later, I ate a plate of grilled veggies and rice from another vendor, which was $5. And, my sister’s favorite was the booth run by the Boy Scouts, where they sold a “wing tray” of BBQ chicken for $4. All of these booths were run by local non-profits, so the food had “home made” flavor, too. Sister got a $5 ice cream at one of the commercial spots, but I preferred the more basic fare. Third, I learned that some acts I would never have chosen to see were among the best. On the first night, I was looking forward to seeing Alan Jackson, but one of the lead in main stage acts was the Carolina Chocolate Drops. This string band was lead by one of the most gifted vocalists I have heard in years, and their performance was filled with energy and precision. 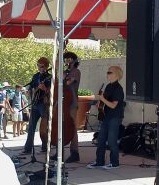 Who would have thought that a trained opera singer would be fronting a bluegrass band? Other stand outs included a band (the Moore Brothers) who were 20, 16, and 11. And, my sister and I both loved the old-time sound of The South Carolina Broadcasters. Lastly, I learned that the many of the festival folks were more tolerant of discomfort than I am. There was rain on day two, so we scuttled into an auditorium and stayed until the showers passed by, but others just found a tree or a tent for a few moments. On the third day, it was hot, and we left the “hillside” during the opening bars of the “album hour” because we didn’t like being fried. Apparently most of those perched on that steep hill stayed. Perhaps the oddest discomfort came from having the more expensive “reserved” seats. As the evening shows progressed, each group was louder than the one before. On the second night, our ear plugs weren’t enough, so we left early, and on the third night we ended up in folding chairs at the back, leaving our reserved seats empty. Some of the performers were asking people to move up to the reserved seats, so I gathered there was a sea of empty seats, which must have been disconcerting (pun intended) for the performers on stage. The instrument sales tent was filled, with everything from high-end custom guitars to “vintage” instruments, such as a Silvertone guitar in need of a neck reset. I even met the owner of Deering Banjos, a company about to celebrate 40 years as the premier maker of banjos in this country. As for luthiery, two Virginia guitar makers, Wayne Henderson and his daughter Jane, did a presentation that was pretty darned interesting, especially when he played his first guitar which sounds pretty good, despite the bullet hole in the back.